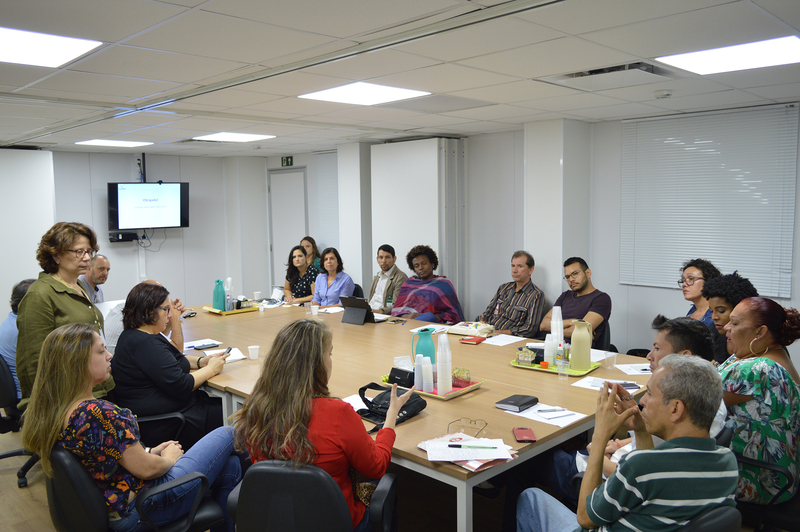 The Brazilian team of ImPrEP project and representatives of organizations of the civil society that integrate the Community Advising Committee of the project, participated in the second meeting of planning, on April 18 and 19, at the headquarters of the Foundation for the Scientific and Technological Development in Health (Fiotec), in Rio de Janeiro. The meeting had as purpose to discuss the plan of activities of the committee and continue the creative process of community mobilization. In the opening, the researcher leader of ImPrEP, Valdiléa Veloso, welcomed the participants and made a general presentation of the project and its actions. During her speech, Valdiléa remembered that according to the recommendation of the World Health Organization (WHO), PrEP shall be made available among the populations with rates of incidence to HIV of 3% or more, while the Disease Control and Prevention Center (CDC) recommends that populations with incidence rates of 2% already shall have access to PrEP. ImPrEP will contribute to new data of incidence in such specific groups, since such information does not exist in Brazil yet. With such actions of the project, it is expected that there is the reduction of incidence of HIV and increase of the use of PrEP among HSH and Transgender women, in the context of combined prevention, groups more vulnerable to HIV epidemics. Upon closing her presentation, Valdiléa announced that the activists Alessandra Ramos and Júlio Moreira will be in charge of coordinating the activities of the Committee, with the support of the executive team of the project. Since the first meeting of the Committee, in November last year, some participants of the Community Advising Committee have developed several activities to disclose PrEP and the ImPrEP project in their states. Associação Estrela Guia (Florianópolis/SC) developed several animated gifs to disclose the services that offer PrEP via WhatsApp and Facebook, GTP+ (Recife/PE) promoted the “Maria Clara de Sena Week of Human Rights and Citizenship”, last March, where PrEP was the topic of discussions among the approximately 60 participants, and Associação Orquídeas (Manaus/AM) also promoted an event on February 06, allusive to the Transgender Visibility Day, which included a specific activities about PrEP. The following were present in the meeting: Luciana Kamel, Nilo Fernandes, Valdir Ermida, Carla Rocha, Brenda Hoagland, Cristina Pimenta, Marcos Benedetti, Clarisse Castro, Vanessa Mendes Cunha, Juana Portugal, and also the presence of other members of the Community Advising Committee; Wladimir Reis (PE), Paulo Oliveira (AM), Keila Simpson (BA), Ludymilla Santtiago (DF), Kelly Vieira Meira (SC), Rubens Brandão (SP), Celio Golin (RS), Alessandra Ramos (RJ), Júlio Moreira (RJ). During the event, a plan of activities was built, essential in the definition of strategies of implementation of PrEP in Brazil. Among the main actions listed are: the qualification of the teams of health care professionals (including the teams of entrance door, reception, and security); the performance of groups of reflexion with the key populations in the health care services; the development of informative materials that may be easy understood, especially for populations who have low school background, making the communication easy to access and easy to understand a priority; the production of specific graphic materials directed to the low-income population; organization of a workshop for journalists and opinion makers – specific activity of the project – about PrEP and about needs, health, and human rights of LGBT population. In addition to such points, several other activities that will serve as pillars to the communication strategies in the implementation of PrEP in Brazil are in development.